A Crown Heights North house was demolished recently in an area that has been calendared for consideration as a historic district, but not designated. It was part of the historic fabric of the neighborhood — and worth preserving. It was covered with modern siding. So what? Underneath the siding on 1480 Pacific St. was a two-story Italianate frame house built between 1870 and 1880, said Suzanne Spellen, an architectural history expert who’s a board member of the Crown Heights North Association (CHNA) and the Brownstoner.com writer who uses the pen name Montrose Morris. If this section of the neighborhood, which preservationists call Phase III, had already won historic district designation, the city Buildings Department wouldn’t have issued a demolition permit. Property owner Two Pacific LLC plans to build a four-story, eight-unit apartment building where the house stood, according to a city Buildings Department filing submitted by the LLC’s president, Zohar Zauber, and LLC officer Farehad Bokhour. BTW, Two Pacific LLC paid sellers Ivy Small-Clarke, Carson Clarke and Michael Husbands $600,000 for 1480 Pacific on May 22, 2014, city Finance Department records show. Plus there’s an assignment of contract dated May 22, 2014 that indicates Two Pacific LLC also paid $260,000 to an entity called Gagou 16 Inc. to assign all right, title and interest from a contract of sale Gagou 16 had signed a year earlier for the property. A real estate broker named Eitan Sror is identified on the assignment of contract as Gagou 16 Inc.’s president. * A 19th-Century Italianate wood-frame house at 1183 Bergen St., which had been the second oldest house in Crown Heights North, was demolished a few years ago before that section of the neighborhood was designated as a historic district. “We lost a gem,” said Deborah Young, CHNA’s chairperson and president. “For a lot of people in the neighborhood, it was a wake-up call that convinced them landmarking was necessary,” Spellen said. A row of small houses now occupies that site. * CHNA was able to save an 1853-vintage Greek Revival/Italianate home at 1375 Dean St. from demolition in 2006. At the group’s behest, the city Landmarks Preservation Commission made the Susan and George Elkins House an individual landmark in an emergency session held just hours before bulldozers were scheduled to start tearing it down. “It was on the edge of doom,” Spellen recalled. In October 2014, the historic house was sold for $995,000 to 1375 Dean St. LLC, Finance Department records show. Nadav Mazor is named on the deed as the sole member of the purchasing LLC. In November 2014, the Buildings Department rejected the new owner’s application to renovate and enlarge the house and change it from a two-family dwelling to a five-unit building. Meanwhile, the exterior looks unkempt, to put it politely. * On the flip side of the renovation coin, Dixon Advisory USA’s rehab of 1148 Sterling Place, which is located in Phase III, looks very tidy from what can be seen from the sidewalk. The cost of renovating this two-family brownstone — and adding a roof deck on the rear yard extension — is estimated at $430,642, according to a Buildings Department filing. 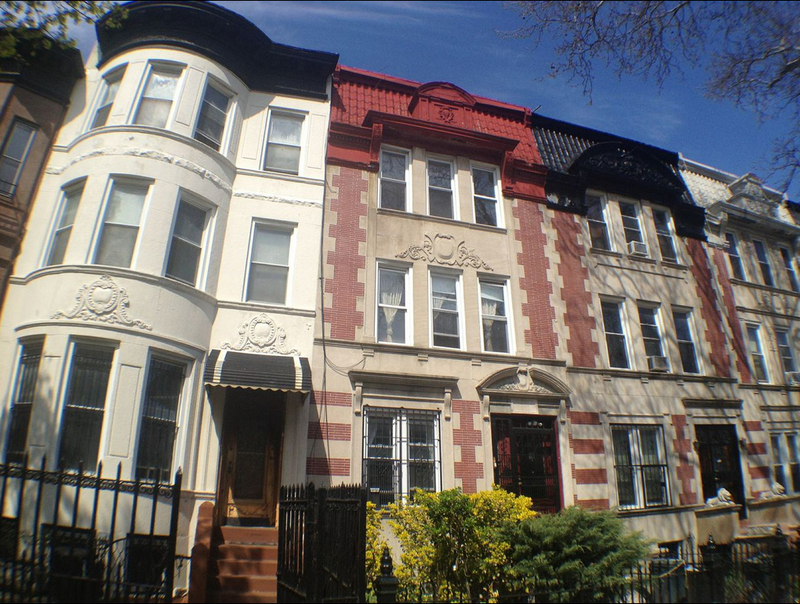 Dixon buys homes in Brooklyn brownstone neighborhoods for its US Masters Residential Property Fund, which is listed on the Australian Stock Exchange. 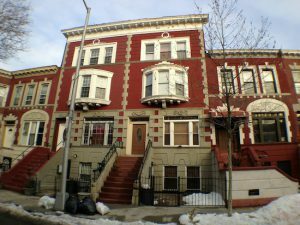 Last summer, Eye on Real Estate took a look at Dixon’s numerous purchases in Bedford-Stuyvesant. But back to Crown Heights North. An LLC associated with Dixon bought 1148 Sterling Place for $650,000 in January 2013 from Tishrei 28 LLC, Finance Department records indicate. A man named Eitan Etah is identified on the deed as a member of the selling LLC. Tishrei 28 LLC had purchased the property for $318,000 in February 2011 from Joanna Mata, Finance Department records indicate. * Speaking of sales, another rowhouse in Phase III, 1463 Dean St., is in contract, according to the Corcoran Group’s website. The asking price had been $899,000. Corcoran’s Daphnee Chapoteau is the listing agent.